Owners of the Motorola DROID Turbo 2 breathed a collective sigh of relief last month when Android 6.0 Marshmallow was officially rolled out to the device. Shortly after it began trickling through cyberspace, though, the update was mysteriously suspended. This left many bemused DROID Turbo 2 owners feeling like they'd had a Marshmallow dangled in front of them before being taken away. Still, Motorola's head of software project management David Schuster has now confirmed that the firmware is in 'full deployment', so those still waiting for Android 6.0 Marshmallow should finally see an OTA notification very soon. Android 6.0 Marshmallow adds a slew of useful features including Google Now on Tap, Doze power management and App Permissions. The remainder of the features, for those interested, are rounded up in our Android 6.0 Marshmallow review. Though it does appear that the recent hiccup has been resolved and that Marshmallow-less DROID Turbo 2 owners should see the update shortly, it may not hit your handset immediately. These updates, after all, tend to be phased. If you'd like to try and speed things along, you can do so by firing up the Settings app, hitting About Device, and checking for the tasty care package that way. 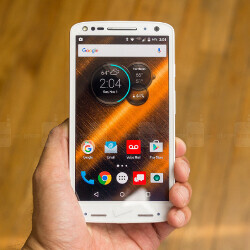 If you've already caught the update for the DROID Turbo 2, let us know how it's going via the comments. Verizon is not the carrier to have if you care about timely software updates. Meanwhile, us Droid Turbo owners are sitting here twiddling our thumbs. I think I'm gonna have to go with an unlocked Moto X when it comes time to upgrade. I tried out my dad's Moto X Pure Edition (got him to buy that when he ditched his iPhone\m/) and it was pretty slick. Meanwhile, us Note 4 owners on Verizon are still twiddling our thumbs. By the time is available the Note 6 will be out.